"Managing this brave new world demands strategic dexterity of a high order." Baseball sage Yogi Berra oncewisecracked that “it’s tough to make predictions—especially about the future.” But while events may confound efforts at detailed prophecy, the broad contours of U.S.-North Korea relations are coming into view. North Korea will disarm neither comprehensively nor irrevocably; the United States will not attempt forcible disarmament unless Pyongyang strikes first; and Washington will put in place diplomatic, economic, and military measures meant to deter Pyongyang from mischief-making the White House deems intolerable. Welcome to the second nuclear age. Doomsday weapons are fewer in number than during the Cold War, thankfully. But states of all shapes, sizes, and cultures now field them, and they configure and deploy their arsenals very differently. Managing this brave new world demands strategic dexterity of a high order. In fact, deterring North Korea—a small, impoverished, yet heavily armed antagonist—demands a strategy no less intricate than the one devised to face down godless Soviet communists. Why? Well, the geometry of nuclear deterrence differs radically from the Cold War, when roughly symmetrical adversaries menaced one another with threats of mutually assured destruction. So does the geography of deterrence. Koreans ruefully describe their peninsula as a “shrimp among whales,” a plaything or battleground for great powers. That was an apt metaphor for centuries. Less so today. Geographic encirclement actually comforts an atomic North Korea. Think about it. Executing an American deterrent threat—raining down fire and fury on the hermit kingdom—would have unintended but foreseeable repercussions for the North’s neighbors. Nuclear fallout could drift across international frontiers. Tides of refugees could swamp Chinese, Russian, or South Korean borderlands, imposing stiff costs on unwilling host countries. And on and on. Regional capitals are parties to the U.S.-North Korean standoff because U.S. nuclear strategy entails such byproducts. Their fears work to Pyongyang’s advantage. A U.S. president might blanch at ordering retaliatory strikes for fear of ruining relations with regional allies, competitors, and bystanders. If so a measure of self-deterrence could take hold in the Oval Office. 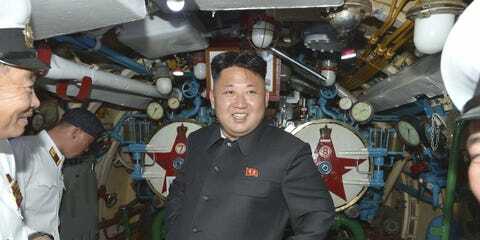 That makes North Korean leader Kim Jong-un smile. In short, U.S. diplomats and strategists must orchestrate interactions with many capitals, not just Pyongyang; keep up the economic pressure to exact an exorbitant price for new proliferation; and fashion military means to forestall not just nuclear aggression but any conventional adventurism that Pyongyang might essay under its nuclear aegis. Such are the rigors of statesmanship in the second nuclear age.